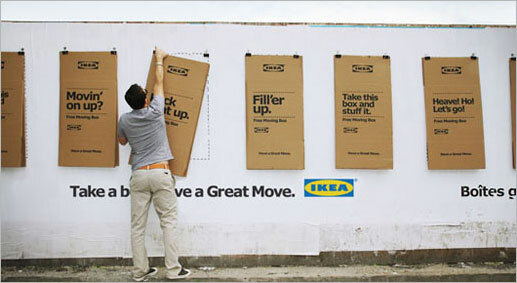 Ikea and Leo Burnett in Toronto recently won a Gold Effie for this campaign featuring cardboard posters that folded out into moving boxes. Decorated with slogans like "Fill 'er up!" and "Take this box and stuff it," they were placed in strategic spots around Montreal in time for that city's Moving Day last July 1. Furniture discounts and dinner offers were also part of the program. Ikea says store traffic and sales rose about 14 percent and 25 percent, respectively. That's dandy. Still, I can't help wondering how many homeless people who came across the street-corner displays were moved to think inside the box—and in this precarious economy, how many others might join them soon. More pics after the jump. Via PSFK.